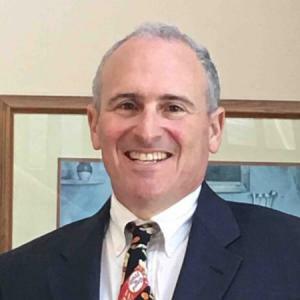 In light of legal developments that affect estate planning, including tax and probate law changes, a web blog provides general information on these subjects. 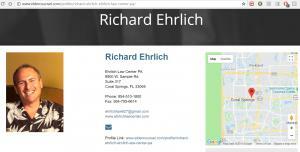 CORAL SPRINGS, FLORIDA, UNITED STATES, July 13, 2018 /EINPresswire.com/ — Richard Ehrlich, the Principal Attorney at Ehrlich Law Center, has announced that he is launching a blog http://richardehrlichblog.blogspot.com/ to report and comment on legal developments in the areas of Estate Planning, Estate Administration, Probate and Small Business Planning. 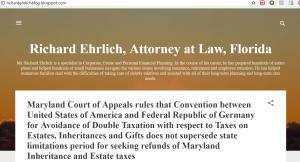 Mr. Ehrlich is a specialist in Corporate, Estate and Personal Financial Planning who has prepared hundreds of estate plans and helped hundreds of small businesses navigate the various issues throughout his career.